Three observations from the Easter Road side's victory in Paisley where Eddie May and Grant Murray assumed control of first-team affairs following the suspension of manager Neil Lennon. David Gray returned to the starting line-up for the first time since October’s 6-0 thrashing of Hamilton after an extended spell out with a muscle problem. The 30-year-old did make back-to-back substitute appearances against Rangers and Hearts last month, but this was a pivotal moment given Hibs have won every match this season when Gray has been included in the starting XI. And that trend continued in Paisley. Sunday’s appearance was just Gray’s 11th start since the end of 2017, an Achilles injury putting paid to his involvement during the second half of last season. 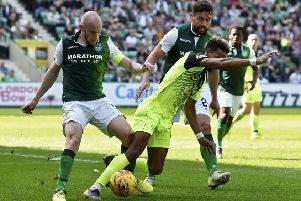 Deployed in his accustomed right wing-back position, his drive and energy really gave Hibs a focal point in the final third, particularly in the second half. Gray is a very intelligent footballer but he also brings that bit of bite every team needs. He is also a popular individual in the dressing-room and that bodes well at a time when his presence may be needed that bit more. The management duo of Neil Lennon and Garry Parker might not have been the only absentees from the team bus for Paisley with Florian Kamberi said to have had his eye on the first plane back to Switzerland following a reported bust-up with Lennon on Friday. However, the 23-year-old – who joined on a permanent deal in the summer – was there to lead the line against St Mirren where he was his usual self, jostling for possession while trying to bring others into play as the lone striker. He worked tirelessly for 90 minutes and was a constant thorn in the side of Saints’ defence, carrying an even greater threat when joined in attack by substitute Oli Shaw. Considering the drama that had gone on prior to the game, Kamberi deserves all the plaudits for what was a very assured display. He showed a lot of maturity for a young player who has had to contend with a lot of criticism these past few months. Oli Shaw is still a young footballer learning his trade, something supporters are too often quick to forget when things aren’t going well. Some believe the 20-year-old won’t chip in with goals on a regular basis, or that he doesn’t have the mould of a typical ‘Hibs striker’. His stats would suggest otherwise. Shaw’s equaliser at St Mirren was his sixth goal of the season in 21 appearances. Considering he’s only made 12 starts this season, that is not a bad return for a player who has been in and out of the side. Hibs looked far more dangerous against St Mirren with Shaw and Kamberi up front, which gives food for thought ahead of next weekend’s visit of Aberdeen.